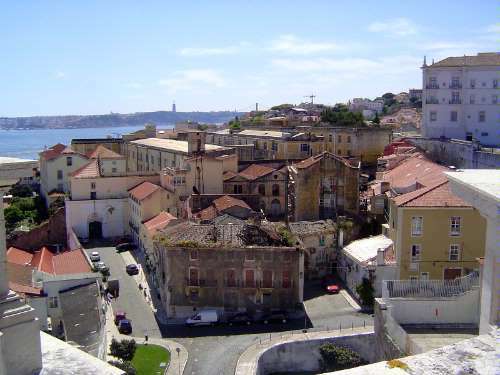 The focus here is on Lisbon at its apogee of power and particularly on Belém--Portuguese for Bethlehem. 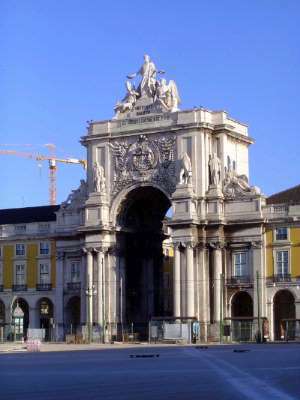 This, in the words of João de Barros, was "the door through which all the triumphs of the conquest of the Orient might enter." 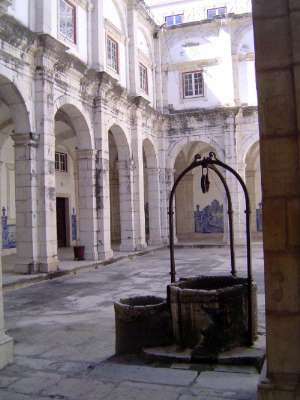 See Paulo Pereira, Jerónimos Abbey of Santa Maria, 2002, p. 16. 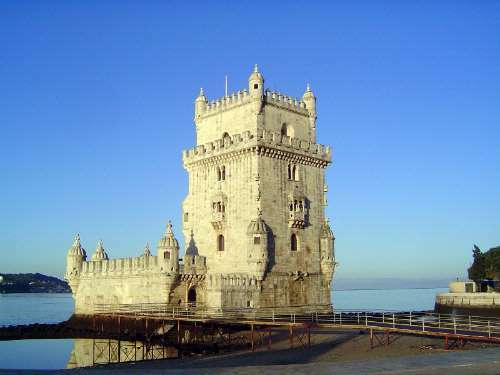 Now on the shore of the Tagus, the Torre de Belém was built mid-river to deter pirates. It hasn't moved; the river has, thanks to reclamation works. 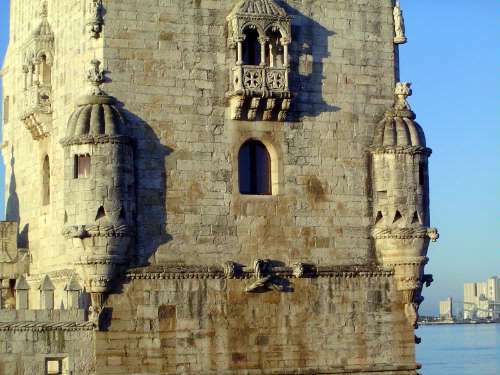 Functional as it was, the tower was also a work of art built by a nation whose self-respect required that even a fortress should be magnificent. 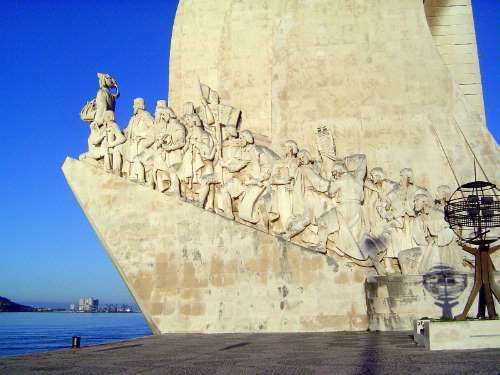 Upstream a bit, a modern monument assembles the country's greatest voyagers. Set back from the river here, there was an old chapel called the Chapel of Our Lady, Star of the Sea. It had been expanded at the order of Prince Henry and put under the control of the Order of Christ. Then it had fallen into disuse. 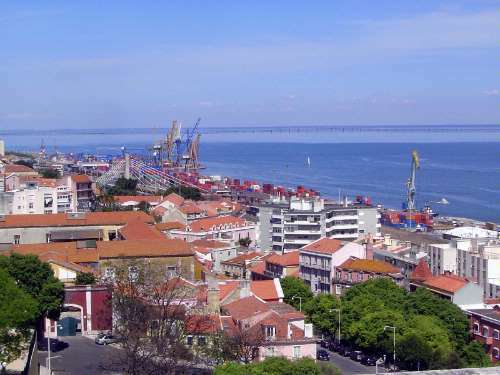 Still, at the outset of his voyage to India Vasco da Gama had spent the night here. 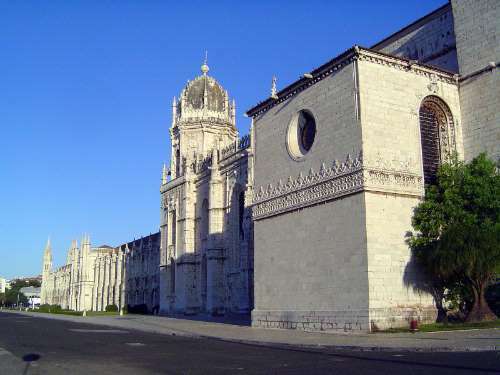 When da Gama returned, a new church was ordered by Manuel I. It was paid for by "pepper money," a tax on spices and jewels entering the country. 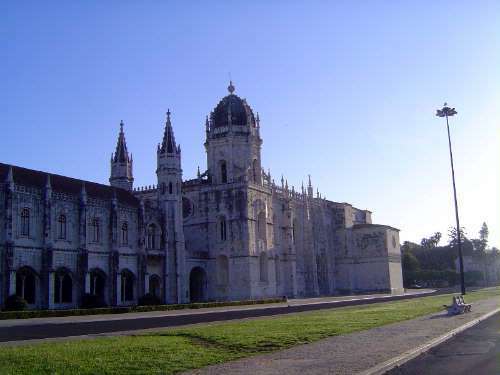 Formally the Mosteiro de Santa Maria de Belém, the church was built as a monastery for the Jeronimite Order, based in Spain and charged with maintaining the funerary cult of the dynasty ruling Castile. 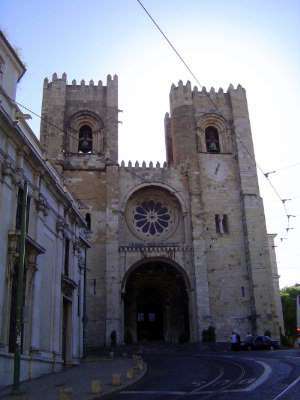 The same order remained in charge of the new church until Portugal disbanded all its church orders, in 1834. 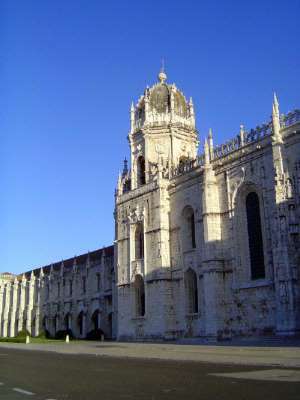 The elaborate side entrance, now closed, was added in 1516-7 by João de Castilho. 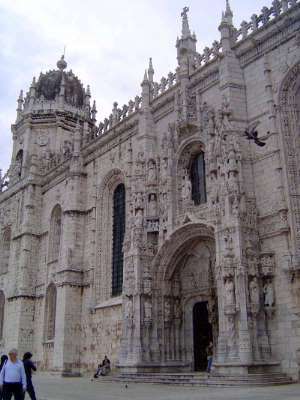 Rarely has a buttress been so ornamented. 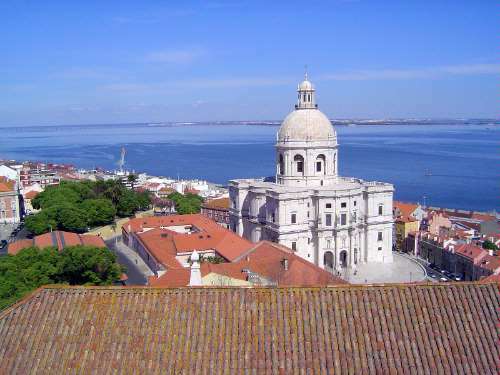 Atop the arch is a figure of Our Lady of the Three Kings, alternatively called Santa Maria de Belém. 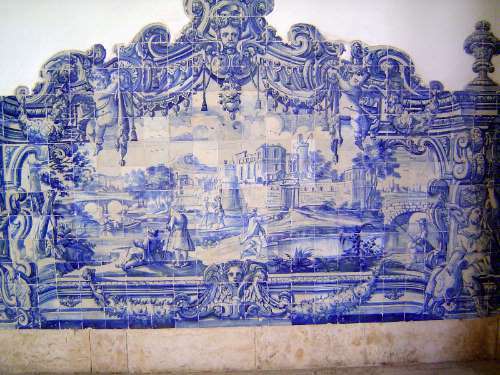 The outward-facing figures are the apostles Peter and Paul. 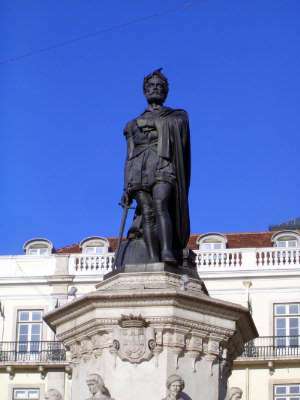 The 16th century philosopher Damião de Góis wrote that King Manuel "ordered that a statue of Prince Henry, who inspired these voyages, be carved in solid stone and placed on the central pier of the door, wearing a coat of mail, unsheathed sword raised high...." The figure was recarved after a 16th century earthquake destroyed the original. 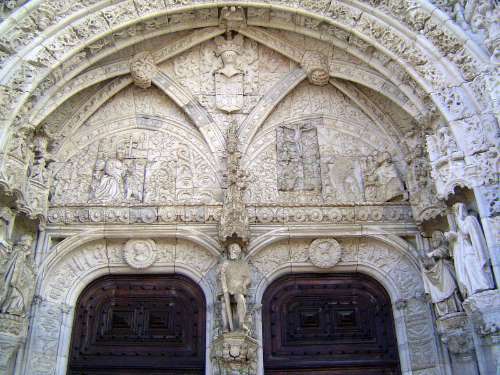 On the left tympanum, St. Jerome removes that famous thorn from a lion's paw; on the right, he appears as a desert hermit. 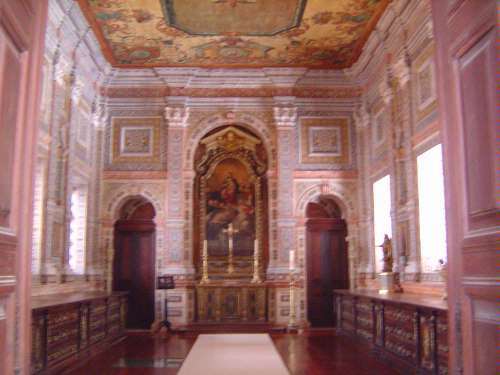 Just inside the main entrance, Vasco's tomb. It's a late production, by Costa Mota Tio in 1894. 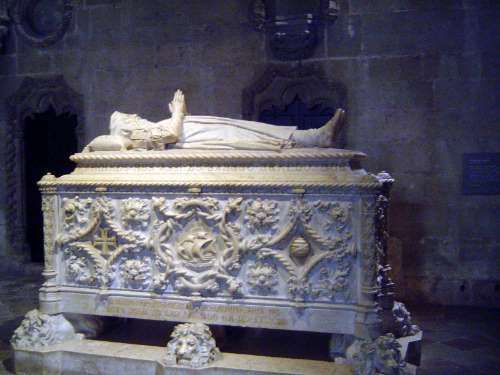 Vasco's presumed remains were reinterred here. 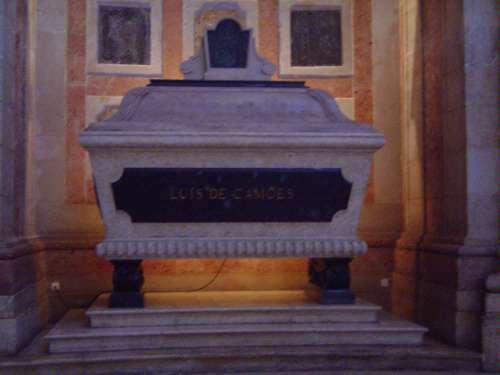 Facing him, the tomb of Luís de Camões, similarly by Tio, 1894. 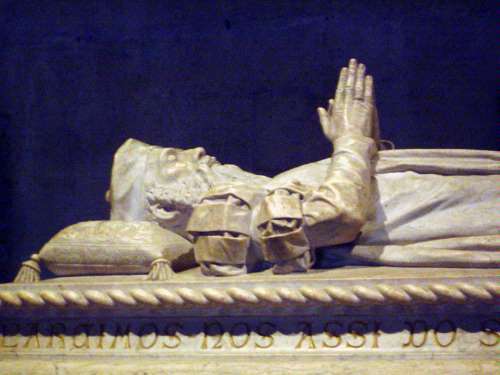 Suffering in his lifetime, Camões rests in grandeur. 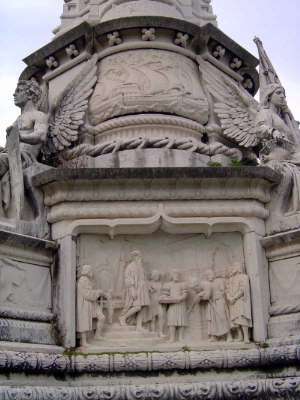 The tomb in its entirety. 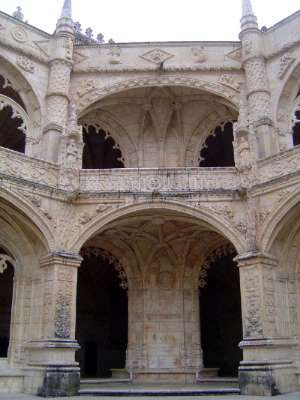 The most spectacular part of the entire structure must be the adjoining Manueline cloister, designed by Teodósio de Frias in 1625 and executed by Diego Vaz. 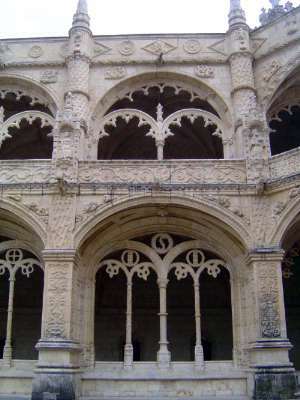 The cloister, covered with gray and black mottling, was restored in 2000. 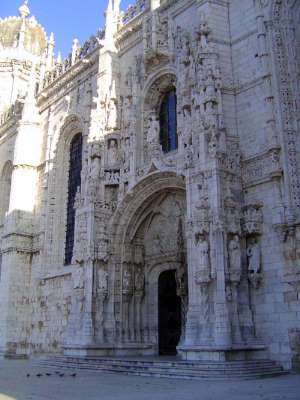 A Latin inscription reads, in translation: "King Manuel, the greatest of monarchs, built on the seashore a vast and magnificent church dedicated to the mother of God. 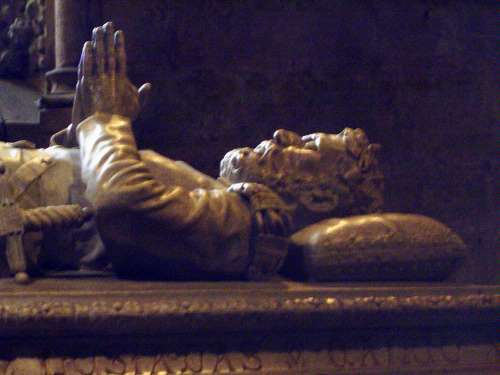 The heir to his kingdom and his piety continued his work. 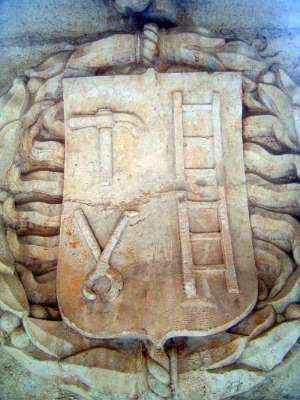 Equal in their faith, in this building each seeks to surpass the other." 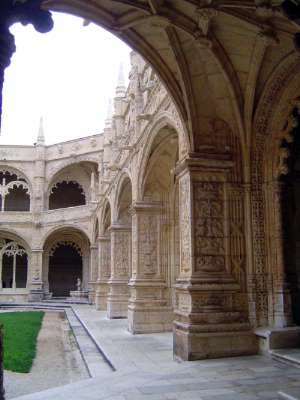 A recent student writes, "When it was built, the cloister was absolutely unique. Nothing like it had ever been seen before. 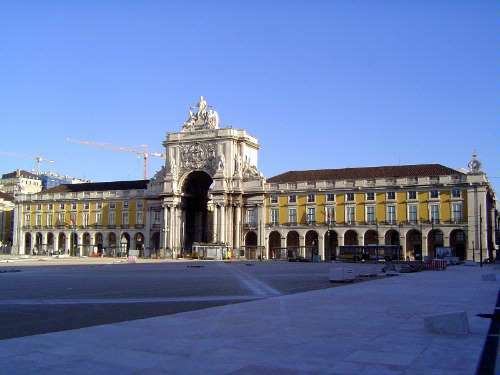 It is built on a square ground plan, its corners cut away from what is virtually an octagon. 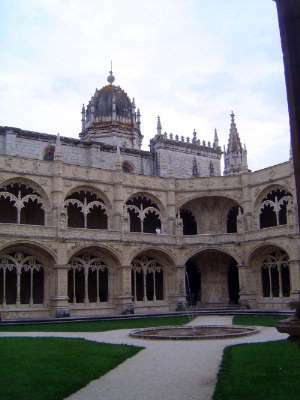 The idea of building two storeys completely in stone was a major innovation and the lavish decoration on the upper storey marked a totally new aesthetic departure, showing the importance that was attached to the cloister" (Pereira, p. 96). These are not the tools of an industrious carpenter. They are the tools to drive and remove the nails of the crucified Christ. 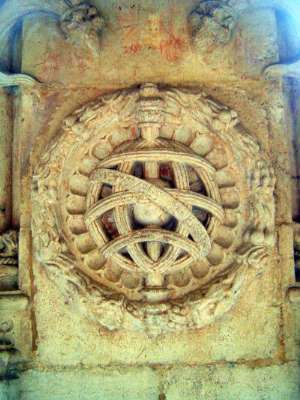 Less grisly, the armillary sphere was the emblem of Manuel, symbolized by his crown. 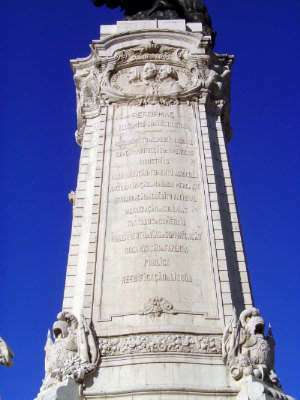 The diagonal inscription reads, "Emanvel R.P. 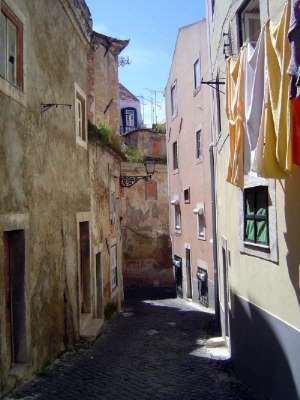 et Alg.V.," which is to say Manuel, King of Portugal and the Algarves. 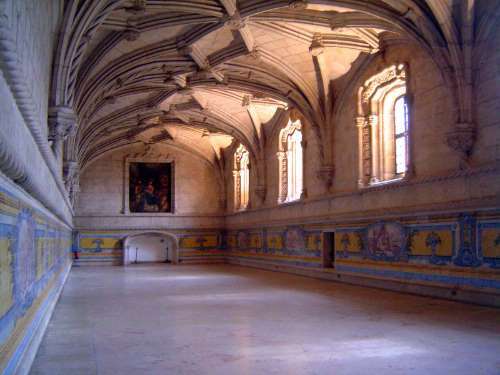 The tiled refectory, from 1517. The vast but much more recent west wing. 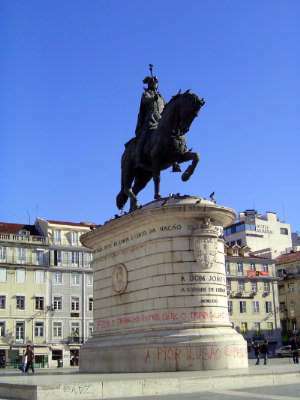 Long after its empire was mostly a thing of memory, the Portuguese continued to celebrate it, here with a statue, from 1902, of Afonso de Albuquerque, who organized the Portuguese empire in the Indian Ocean. Albuquerque in a gracious humor. At a less friendly moment. 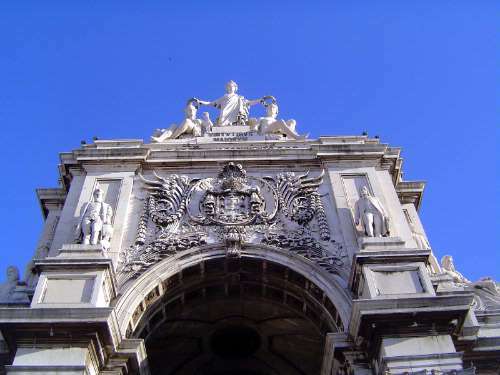 The two figures on either side of the arch are Vasco and the Marqués de Pombal, whose writ extended far beyond 18th century Lisbon as the man behind the words sought to revivify the empire. (His hand was heavy in Goa, for example.) 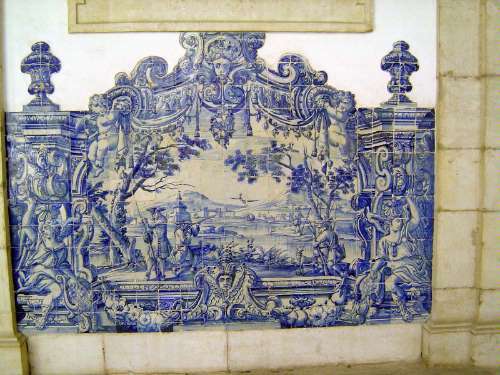 The reclining figures at the far sides represent the rivers Tagus and Douro. 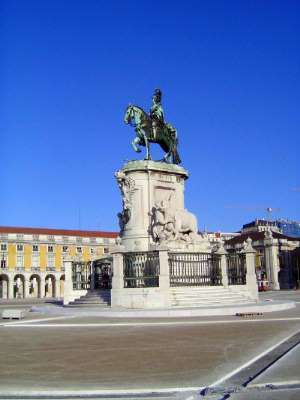 In the middle of the square, a giant equestrian statue of José I was erected in 1775; the cast bronze weighed in at 80,000 pounds. 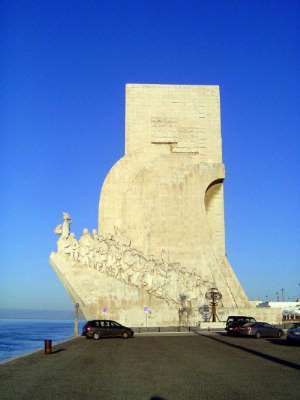 At the base is a stone elephant, symbolic of Portugal's eastern empire, even though that empire had shrunk drastically. 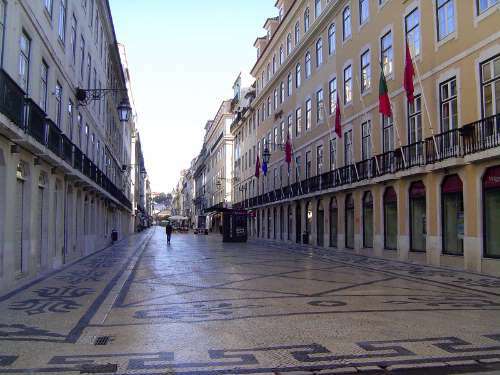 On the other side of the triumphal arch, the Rua Augusta is the main axis of the street grid that was laid out in the aftermath of the earthquake. 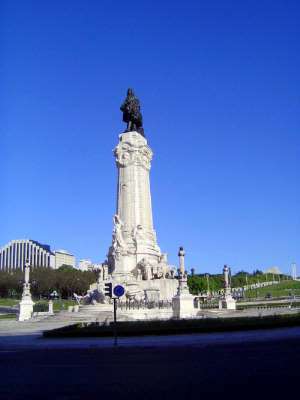 On the hill to its west, there's another plaza and statue to the memory of Camões. He holds a sword but also, over his heart, the text of his poem. These things die very hard. 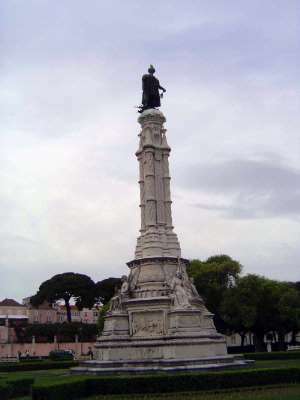 Here, a statue of Dom João I in the Praça Figueira. 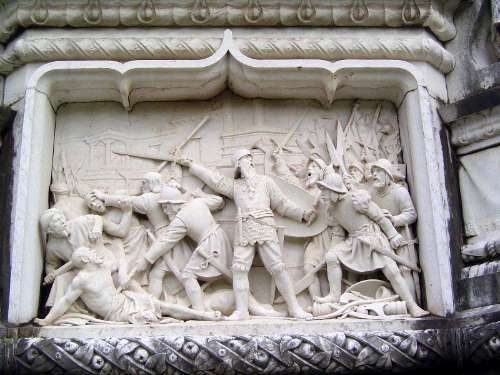 The statue is dated, unbelievably, 1971, as if to prove the maxim that dictators--in this case Salazar--can never have too much imperial glory. 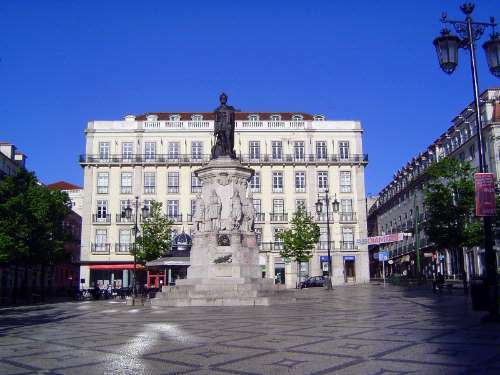 At the head of the rebuilt city's main axis, the Marqués de Pombal himself. 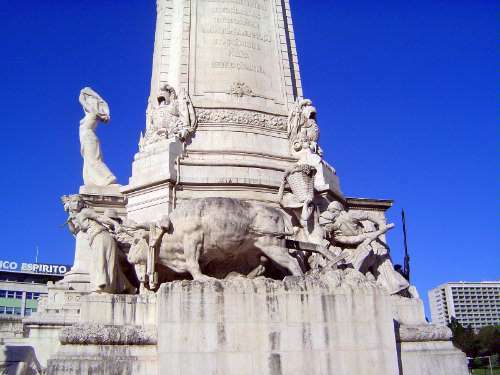 The base of the statue celebrates honest labor, or at least hard labor. A record of his achievements. We'll briefly run up the hill to the east. This? Oh, it's the Sé, or bishop's seat, which is to say the cathedral. It's been heavily renovated after repeated quakes. The streets now become interesting. And steep. The view here is from the Pantheon. The view upstream from the same vantage point. A couple of miles upstream from the bridge in the distance, the river narrows drastically. 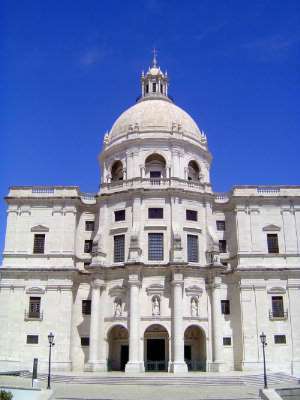 The pantheon dome--formally, the Dome of Santa Engrácia--rises in the ancient district called Alfama, where traffic is restricted, much to the disgust of right-thinking, freedom-loving, rule-skirting Americans. 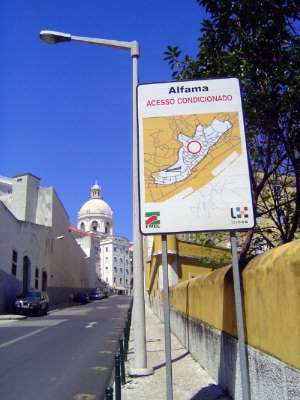 Sure enough, the name Alfama derives from Arabic, in this al-hamma, or bath. 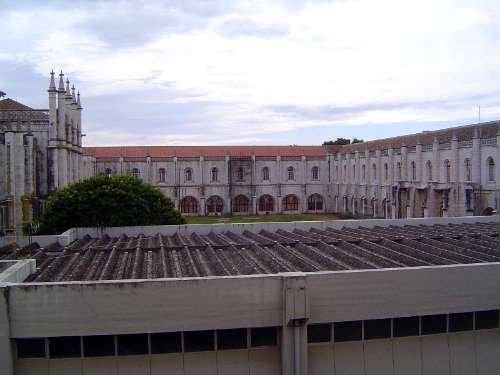 There's another monastery up this way, the Mosteiro São Vicente de Fora. Here's the extravagant map room. 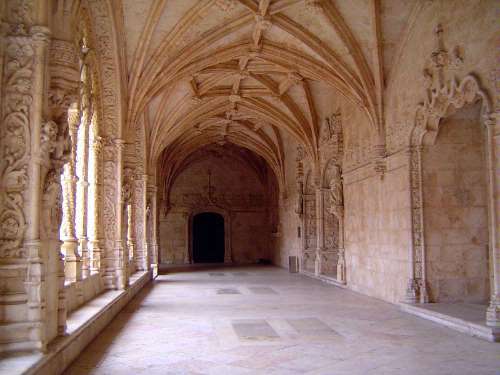 Baffling, isn't it: what use should maps be in a monastery? 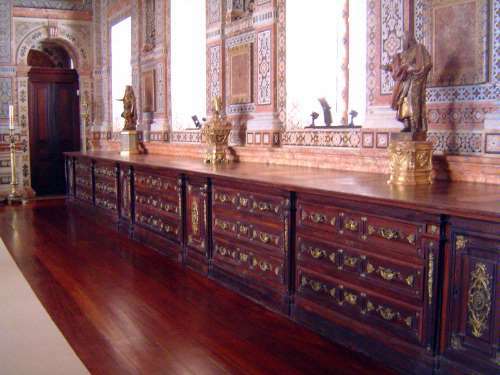 No matter, you have to admire the cabinetry. 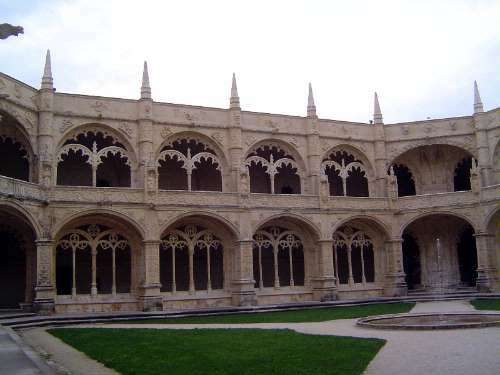 The cloister is handsome but no match for the one in Belém. 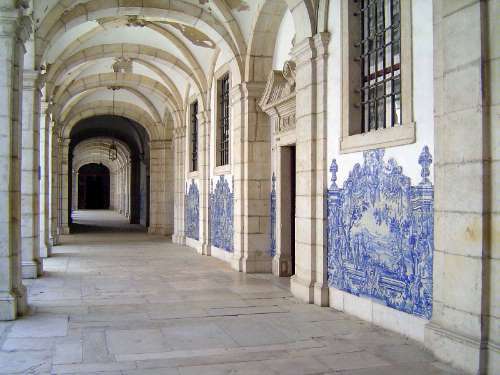 São Vicente de Fora is Lisbon's patron saint; the monastery is Augustinian and specializes in tiles, azulejos. It's not easy to disentangle the geographies here. Some are clearly biblical; others may be imaginary. From here you can gaze down on that Pantheon dome. Old? Hardly, It was completed in 1966. 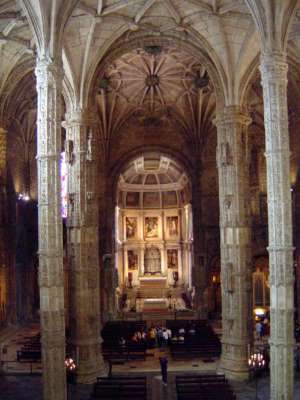 Inside: a set of cenotaphs, which is to say empty tombs. The usual suspects. 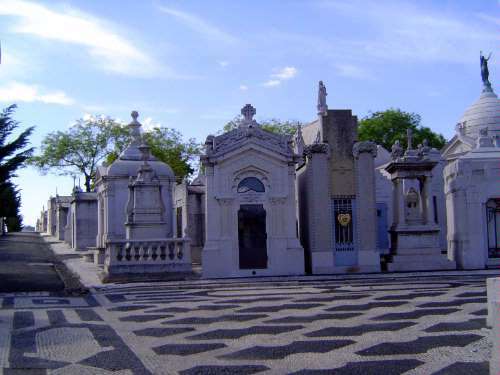 A couple of miles away, there's a commoner's cemetery, crowded as everyone vies for recogition.